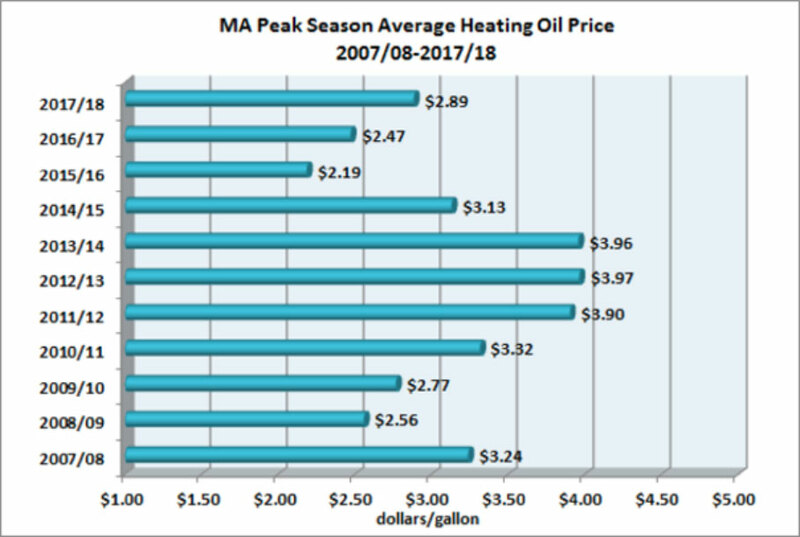 In reviewing this past season’s heating oil prices and comparing it to the chart below, it appears we are feeling the effects of OPEC’s attempts to curb the glut of oil. This glut has kept oil prices below OPEC’s target. They have succeeded so far. Heating oil prices are 25% higher than last year. We are still not in the same range as we were 5 years ago, but if the OPEC and their supporters succeed, we could see prices as high as 4-5 years ago. On the other hand, if their efforts fail and prices collapse, we could see a return to the moderation that we have seen over the last 2–3 years. This graph chronicles the highs and lows that happened during peak season in each year. At this point, we are at the same price points as 9 years ago. Is this a typical cycle that could be repeated in the future? For now, we need to take it one year at a time and offer fuel programs that will work to meet our customers’ needs. Another year is upon us and we have many things that are shaping our heating oil prices. OPEC and non OPEC producers are still committed to slowing production to reduce the glut of oil in the world market, resulting in higher prices. So far this strategy seems to be working. Since last fall, the oil prices are up over 50%. It is uncertain whether this trend will continue resulting in high prices not seen in 6 or 7 years. There is also the matter of our shale producers, who seem to be able to counter the effects of OPEC’s actions whenever the price goes up. They bring on more rigs to pump oil and this response seems to help keep prices steady. Although this year it is unclear whether they will completely offset the oil shortfall due to restricted pumping. Meanwhile, we have political turmoil around the world. How will this affect prices? Is our weather going to be warmer or colder than normal? We have a global oil market where the only certainty is volatility. So where does this put us as we move into a new heating season? How will this supply conundrum impact our prices? How can we best protect ourselves from uncertain energy costs? With this uncertainty in mind, we have designed fixed, floating and capped oil contract options. These are all designed to give you choices and peace of mind by controlling the cost of your heating oil. These options should satisfy most customers with protection solutions. New this year is a 12 month guaranteed price ceiling budget with downside floating protection. In the event that the markets return to the lower prices of last year, your deliveries would automatically be charged the lower price. We opted for more months to lower your payments, spreading the cost over a full year. We still have our prepaid oil contracts that enable consumers to “lock in” a fixed price. This offers peace of mind and prevents a possible spike in the oil price, should conditions become volatile in global oil markets. Our other prepaid plan is a floating plan that discounts $ .15 off the current market price. This year we are adding the option of downside protection with a guaranteed ceiling price. Our vision and hope is that we have stable markets where we can provide our customers the best protection against market volatility. We appreciate the opportunity to serve our customers with the best prices and service available. Please feel free to contact us with questions about what the best solution would be based on your personal needs.